The Castles of Burgundy is a very challenging and fun strategy game for 2-4 players, designed by Stefan Feld and published by Alea / Ravensburger. It was originally released in 2011 in Germany but is now widely available in a multi-lingual edition. 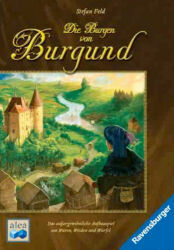 The game is set in the Loire Valley and each player represents a prince trying to lead their estates to prominence by developing sections of the estate towards trade on the river, farming, mining, constructing valuable buildings or castles and developing scientific knowledge. Whoever best develops their estate is the winner. The game is played over five phases each of which is made up of five rounds. In each round, every player takes a turn in which they can conduct two actions, meaning everyone gets 25 turns or 50 actions. The game has a central board which contains the stuff players can use in each phase as well as tracking the order in which players take turns, how the game is progressing through the rounds and phases, and a score track for showing how well the players are doing. In addition, each player has their own player board, representing their estate, and onto which they are going to place the castles, buildings, pastures, mines etc. that will build up their prestige (or score). •Recruiting two workers, which enable you to manipulate the dice you roll. This last action doesn’t directly advance your standing in the game but is important because the numbers on the dice you roll restrict how you carry out the other actions: estate tiles on the central board are spread over six numbered areas and you can only take a tile from the area shown on your die; the spaces in your estate are numbered 1-6 and you can only place a tile in the right numbered space; and each goods type is numbered 1-6 and you can only sell the type matching number on your die. Hence, having workers to change the dice results is pretty important. There are several other details that add to the richness of the game but the above description gives you the main idea. Obviously, whoever has generated the most points over the course of the game can claim to be the most influential prince and the winner. There is a lot going on in this game. When you start to play, you may feel overwhelmed by the myriad of choices you’ve got. However, in some ways, this helps ease the players into the game because there are lots of ways to make your estate better and whatever you do will move you forward. As you move into the second and third phase, you’ll start to see how each of the elements work together and can hone in on what you think will work best. That’s not to say that your early decisions are meaningless, as an experienced player will get more out of those early turns and build on the advantage they gain. However, the dice bring an element of fortune into the game and a good start doesn’t necessarily guarantee a good result, particularly if you haven’t got workers to enable you to manipulate the dice results. The game seems to scale very well between two and four players, as the number of tiles made available at the beginning of each phase varies based on the number of players. The box suggests the game takes between 30 and 90 minutes to play, less time with fewer players, but I would expect the first time you play to take longer as you try to come to grips with what you’re trying to do. In addition, if you’re playing with opponents who like to over-analyse all the options they have, that will make the game last longer. Overall, this is a very good choice for someone looking for a game requiring a fair amount of thought and foresight and I enjoy it a lot. It is easy enough to play - roll two dice and pick from four actions - but it’s not easy to play well. You do need to think about what you’re trying to achieve so don’t choose this if you’re wanting to play something without some degree of concentration. I would recommend it for two, three or four players looking for a clever strategy game. Disclaimer: I was supplied with an English review copy of the game although I had already played and own a copy of the original German release.